In the Sydney Summons Division of the Water Police Court to-day C McDonald, master of the Euryalus, was charged with a breach of the Quarantine Act in making a false answer to the port health officer on the arrival of his steamer at Sydney, on 8th March, to the effect that no sickness had occurred during the voyage from Calcutta, and it was stated on behalf of the prosecution that the passenger from Calcutta named Clark had a mild attack of small-pox. He was seen by the captain on board and isolated. 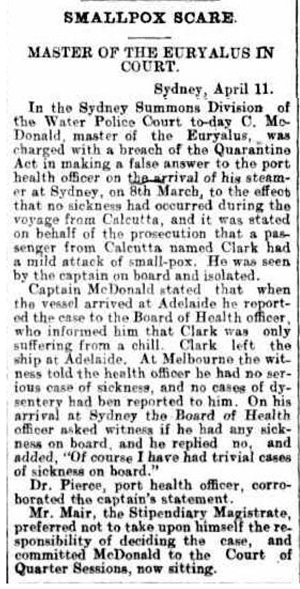 Captain McDonald stated that when the vessel arrived at Adelaide he reported the case to the Board of Health officer, who informed him that Clark was only suffering from a chill. Clark left the ship at Adelaide. At Melbourne the witness told the health officer he had no serious case of sickness, and no cases of dysentery had been reported to him. On his arrival at Sydney the Board of Health officer asked witness if he had any sickness on board, and he replied no, and added, "Of course I have had trivial cases of sickness on board." Dr Pierce, port health officer, corroborated the captains statement. Mr Mair, the Stipendiary Magistrate, preferred not to take it upon himself the responsibility of deciding the case, and committed McDonald to the Court of Quarter Sessions, now sitting.